While there is some concern that giving your cat a taste of the great outdoors will turn him into a demanding cat who sits by the door meowing incessantly to go out, many feline experts believe that the greater danger lies in providing a living environment for the cat that is unchanging and unstimulating — just plain boring. The stress of boredom can be a contributing factor in a number of destructive behavior problems (eg., furniture scratching) as well as in some physical and psychological problems (eg., obesity, over-grooming, feline depression and not using the litter box). While much can be done to make the home environment more interesting for the cat, nothing can compare to the excitement of the ever-changing outdoors. Of course, allowing Kitty to roam outside freely would be irresponsible and dangerous. Unsupervised, your cat faces the very real dangers of road traffic, irate neighbors, disease, and other predatory animals. Leash training can add a new dimension to both of your lives. Cats look forward to their outings just as much as dogs enjoy their walks. If taken out at approximately the same time every day, Kitty will learn that this is the only time he can go out and there’s no point in pestering the owner at other times. A good schedule is key. It’s always easiest to introduce new experiences to kittens who tend to view life as a big adventure. However, even older cats can be trained to accept a harness and leash if the owner is patient, persistent, and sensitive to the cat’s body language. Each small step of progress toward the ultimate goal is rewarded with praise and food treats. At no time should the cat be punished, scolded or forced to do anything that frightens them. It may take weeks of conditioning for the adult cat to feel comfortable with this procedure, but the result is well worth the effort involved. Step 1. Purchase a harness that is designed to pull from the chest, not from the throat. A harness is preferable to a collar because if properly fitted, it will provide less opportunity for Kitty to wriggle out of it. You should be able to slip two fingers between the harness and the cat. If it is too loose, the little escape artist will be out of it in no time. The leash should be lightweight and detachable and have a clip that closes tightly. We do not recommend the ‘figure eight’ style harnesses, as these can p inch Kitty and make the harness uncomfortable. Instead, the preferred design should be an “H-style” design, with two independently adjustable loops connected by a third piece of material. There is a different version, a body harness which fits around the upper portion of the cat like a small jacket giving them full body movement and doesn’t dig into their skin or pull on their fur. Step 2. Let your cat get used to the harness and leash by leaving them out near his favorite sleeping place for a few days. The training process begins inside the house. Before placing the harness on the cat, prepare Kitty’s favorite meal–something so delectable that it makes him forget about everything else. Immediately after placing the harness on him put the food in front of him. Praise him profusely. After he is finished eating, let him walk around for awhile getting used to the feel of his new wardrobe. Distract him with toys if he seems unhappy with the harness. After he has visibly relaxed, the harness can be removed. Step 3. Attach the leash to the harness. Don’t try to walk Kitty at this point, just let him walk where he pleases, dragging the leash behind him. Always supervise these sessions in case the leash gets caught on something. Most cats will accept the addition of the leash readily, but if yours becomes agitated, divert his attention, as before. Encourage Kitty to walk, and when he does, shower him with praise. Keep these daily training sessions short and positive. Step 4. Once your cat is at ease with the harness and leash, pick up the leash and walk around the house behind them, being careful to keep the lead slack, DON’T pull at all. At this point you do not want to restrict the cat’s movement, just let him get used to having you follow him. Practice this for a few days. Step 5. Now its time to teach Kitty to go where you want them to go. Using a sweet, high-pitched voice, encourage them to follow you. (Kittens have a natural follow-Mom response.) Adult cats will need a little more reassurnce. Don’t expect them to walk like a dog. Allow Kitty to wander from side to side within the confines of the length of the leash, but do not veer off your predetermined course, don’t just let them wander around, guide them gently. When the cat feels resistance, he will either walk in your direction, or lie down. Patience and persuasion are the key words here. Never pull or jerk the lead to force your cat back in line. One bad experience may turn your cat against leash training forever. Step 6. Once Kitty is walking comfortably on the leash inside the house, you can introduce him to the outdoors. It may be best to simply sit with Kitty on the stoop outside for the first few jaunts. Let him become used to the sights and sounds of this new, and somewhat scary, world. You’ll know when Kitty has adapted to this new environment. He will look relaxed, nervous tail twitching will stop, and he will show an interest in exploring. Let him. Now find a quiet location that will present as few frightening elements as possible and follow the same procedure you used to accustom them to walking on a leash indoors. (Remember, never leave the cat outside unattended). 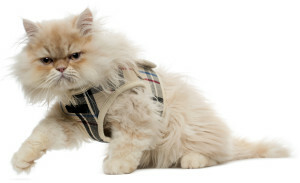 Now your feline friend can join you for walks around the neighborhood, picnics, even window shopping. Trips away from home (eg.to the vet) will also be easier for you and less traumatic for your cat.